"Feather" redirects here. For information about the item from Mario's Time Machine, see Feather (Mario's Time Machine). For the collectible that's also known as Feather in the GBA version of Donkey Kong Country 2, see Golden Feather. A white and orange feather. The Cape Feather is a power-up that transforms Mario and Luigi into Cape Mario and Cape Luigi, respectively. It first appeared in Super Mario World. The Cape Feather first appeared in Super Mario World. When Mario or Luigi grabs one, it turns them into Cape Mario/Luigi. As Cape Mario or Cape Luigi, the player can glide through the air, similar to the Super Leaf's effect in Super Mario Bros. 3. If the player runs at full speed before jumping to take off, they can control the flight with . Pressing backward will slow Mario's speed and make him ascend, and tapping it repeatedly will allow Mario to continue flying, possibly to the end of the level; pressing forwards speeds up Mario and has him descend. The player can also attack enemies by spinning the cape by pressing . Additionally, the Cape Feather is available as an additional item in Super Mario Advance 4: Super Mario Bros. 3. By scanning in the appropriate card on the e-Reader, the player can upload a Cape Feather into their inventory to use in the game. Cape Mario plays just like he does in Super Mario World, including being able to defeat enemies like Dry Bones. The Cape Feather, along with other power-ups from Super Mario World, makes a cameo appearance in the Mario Slot and Super Mario Slot minigames of Super Mario 64 DS. If the player lined up three Cape Feathers in a row, they would receive five times the number of coins they bet. In the main game, the feather that transforms Mario into the similarly-controlled Wing Mario resembles the Cape Feather. The Cape Feather and Cape Mario return in Super Mario Maker, Super Mario Maker for Nintendo 3DS and Super Mario Maker 2, but only in the Super Mario World style, acting the same way they did in that game. A Cape Feather, as seen in the Super Mario World animated series. The Cape Feather also appears in the Super Mario World TV show, where it is used in episodes such as "King Scoopa Koopa" and "The Night Before Cave Christmas." Mario is the only character to don the cape in the series. The "Feather" (as it is referred to in this game) is also found used in Super Mario Kart for the SNES as an item a driver can obtain from ? Panels throughout each race course (except the Mario Circuit and Donut Plains courses). The Feather grants the user the ability to perform a Spin Jump roughly twice as high as a regular driver can. This can be useful for jumping over barriers, as a quick and easy shortcut, and for jumping over enemy projectiles. 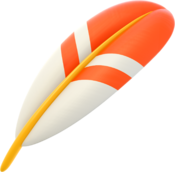 Additionally, while it did not appear in the final game, in a pre-release version of Mario Kart 64, the Feather appeared to be one of the items. After 25 years of absence from the Mario Kart series as an item, the Feather returns in Mario Kart 8 Deluxe. It only appears in Battle Mode. Working like a normal trick, it can be used to jump over obstacles, steal a balloon, coins, or the Shine Sprite (depending on the mode) from an opponent if they are hit upon use or landing, exit gliding, and/or get more height in a trick jump, though only if the player is not already airborne. Artwork from Super Mario World. Artwork from a Nintendo Power feature about Super Mario Kart. Cape Mario with Yoshi, holding a Cape Feather, from Super Mario World: Super Mario Advance 2. Artwork from Mario Kart 8 Deluxe. In Mario Kart 8, the course Sunshine Airport contains feather pens on desks that have the exact same design as the Cape Feather. These same feather pens can be found at the ticket booth desks in Super Bell Subway. In Captain Toad: Treasure Tracker, Wingo has a Cape Feather on his turban, though the details are red rather than orange. The Cape Feather has had the longest absence of all other items in the Mario Kart franchise, spanning over 24 years. ↑ Super Mario World: Super Mario Advance 2 instruction booklet. Page 19. This page was last edited on April 1, 2019, at 12:22.